From smock dresses (under $30) to off-the-shoulder, ruffle details, bell sleeves, cold shoulders and asymmetric skirts...even down to the tiniest details like these bow stud earrings (under $10), we only thought gingham was in last year! 2017 is a whole notha levelllll. Compare my skirt's $49 price tag with these high end options! 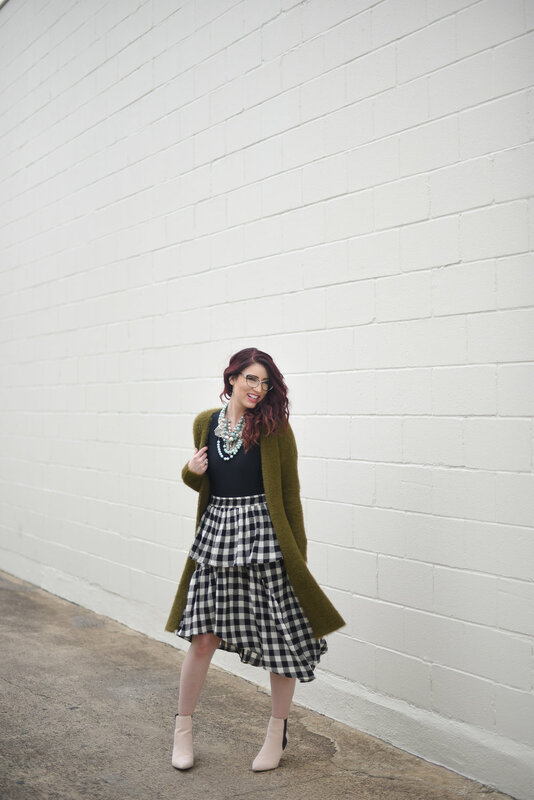 My first reaction when I tried this skirt was… “What would I ever wear with it? !” Once I started playing around with different options, I realized I have an endless number of pieces that compliment it surprisingly well! Even though each outfit is totally unique, they all feature the same bodysuit, skirt and booties. 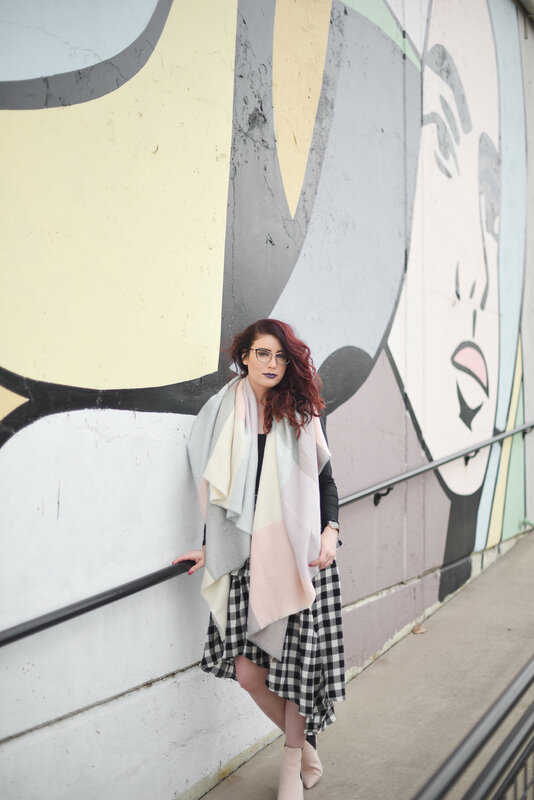 My desire is for you to see how versatile a few basic pieces can be in a wardrobe, AND how only a few swaps with outer layers can totally change the look! The barely blush booties are a perfect transitional buy—you might as well be wearing a neutral, because they match everything. I’ve been sporting them nearly every day, so I wanted to actually show you how real the repeating game is (see them in this post too)! When you find a versatile shoe, it really doesn’t matter if it was an expensive investment or a cheap find (like my $49 score)! I’ve been hesitant with the pom pom cap trend, because—same thing—what in the world would I wear that with?! But alas, the preppy quality in the puffy cap paired perfectly with the gingham! Almost hints at an equestrian vibe, but the zipper jacket keeps the cool factor alive. The hat is on sale for $8.50…might be worth you taking the risk with something new! I just love this look. The green fuzzy cardi is another piece I’ve been over-wearing lately. It’s so warm that it functions as a jacket for me on many days! I personally think mint is such a gorgeous color mixed with the olive tone, and I thought a few layered statement necklaces added some interest and personality. Practically any pop of color would work with this look! Think hot pink, bright orange, royal blue, or even yellow! 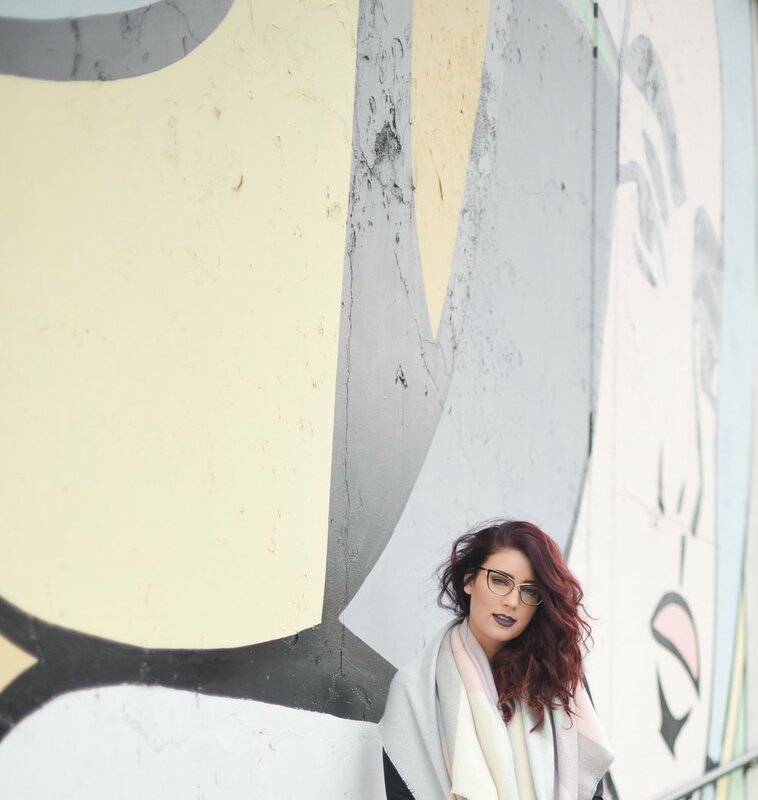 It seems every girl needs a blanket scarf that could potentially swallow her whole, right?! 😂 I love pastels and found the soft plaid pattern to be surprisingly pretty with the bold gingham! A quirky pairing pulled together by the blush booties. 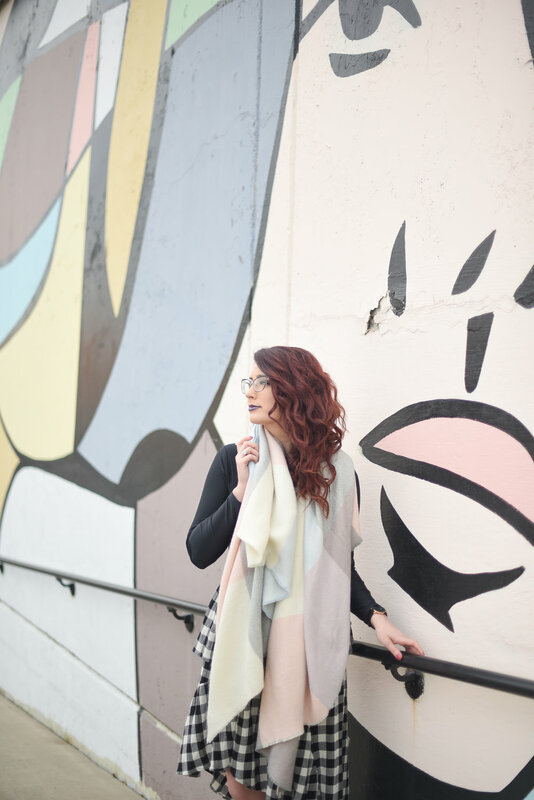 My exact scarf has been out of stock/low in stock over the past week, so if it's in stock, then get it while it's good! Currently under $20. Here's an almost identical option if mine is sold out. I wore this darker NYX lip color to contrast with the pastels. Which look is your favorite?! Leave me a comment and tell me if you plan on bringing any Spring trends into your Winter wardrobe!